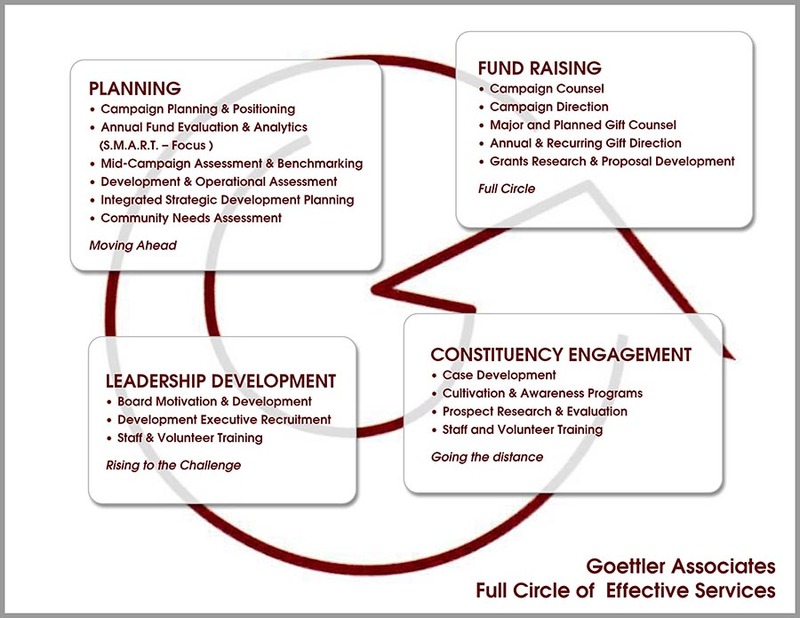 Goettler Associates’ professional services will keep you Moving Ahead through careful and deliberate fundraising strategy and Planning. The campaign planning study (called the feasibility study by some) is a fundamental step in preparing for an intensive major-gift capital campaign and serves as the starting point for most successful fund-raising efforts. In the course of the planning study, potential donors and volunteer leaders will be interviewed to obtain their perceptions, judgments, and opinions of your proposed plans. The planning study provides a comprehensive picture of the direction the campaign should take, and to whom it should be aimed. The detailed information gathered during the study will be one of the primary tools you will use in planning your fund-raising strategy. The study report is an invaluable planning document that contains a recommended campaign goal; a summary and analysis of interviews, statistical documentation, direct quotes without actual attribution; and, most important, recommendations for continued campaign planning, preparation, and implementation. Goettler Associates can provide a wide range of objective, timely, and effective evaluation and planning services directed at immediate improvements to an organization’s annual or recurring gifts program. Unlike the traditional development audits that study an organization’s deficiencies, we begin by focusing on existent capabilities and strengths to create a practical plan that can be quickly implemented. Our popular and moderately priced SMART-FOCUS Fund-Raising Analysis adopts a strength-based approach to our analysis and can be completed in a matter of weeks. Our report and recommendations will focus your efforts on quickly improving and sustaining increased fund-raising results. What’s different about our SMART-FOCUS approach? We don’t believe that weaknesses and strengths are necessarily opposites when it comes to improving performance. That is, focusing on weaknesses does not create strengths. Perhaps you have observed a situation where an in-depth assessment of a department or operational function concluded that steps must be taken to correct the personal behavior or skill sets of various staff members. The process can be time consuming, stressful, and expensive. And the results, as they are based on identified weaknesses; do not automatically strengthen the operation’s effectiveness, particularly in the short term. Unfortunately, campaigns sometimes hit a plateau for a variety of reasons. An objective mid-campaign assessment will include an analysis of progress to date, confidential interviews with campaign leaders, review of prospect evaluations, constituency segmentation, and local and national benchmarking to carefully redirect efforts and strategy to achieve success. An organization or institution may conduct a development assess-ment to evaluate its entire current development function. The assessment involves interviews with all key personnel, as well as an extensive review of program records and documentation, information systems, publications, and management structures. Our holistic approach to fund raising works to establish development as part of the institutional advancement culture, and prevents the Asilo effect that can inhibit robust fund raising. During the assessment, a professional examines and evaluates the development personnel, ongoing and former fund-raising programs, existing procedures, and the maintenance of records and data. The findings of the investigation will form the basis for strategies to integrate development as part of every staff member and volunteer responsibility to advance your institution. A strategic plan can bring a renewed sense of direction to an institution. We believe the strategic planning process is closely linked to institutional development: it is a method of articulating and implementing policies that will govern the use of an organization’s resources in the pursuit of its mission. Strategic planning also provides a significant opportunity to involve staff, volunteers, and especially community leaders in shaping future priorities. However, Strategic Planning is often conducted only with limited internal staff and board perspectives, or more accurately resembles operational planning, rather than considering the entire environment in which the organization is operating. Most important, strategic planning should consider development goals to partially or fully fund the organization’s future aspirations. Our work involves the careful research of both internal and external stakeholder perspectives of the organization, establishing a board and staff partnership to build future goals and objectives for the organization based on its constituencies, needs and desires. Organizations are increasingly required to conduct a careful assessment of community and constituency needs to fulfill regulatory requirements. Too many organizations achieve regulatory compliance without realizing the opportunity to also quantify the marketplace perspective and thus build stronger strategic plans or a more compelling case for support and fund-raising appeals.